Fotor Photo Editor comes loaded with tools for every essential editing need, plus tilt-shift, 13 unique 1-tap enhance options, over 60 effects/30 frames, RAW support, built-in sharing, and high-resolution saving. Collage away. Pick from 60 different templates or customize one, and choose from 16 backgrounds. Upload up to 30 photos to mix and match. Finish off your masterpiece with the border color or pattern that catches your eye. Fotor's state-of-the-art photo processing engine makes it easy to process high quality photos quickly. Adjust exposure, brightness, contrast, white balance, and saturation, sharpen/blur, vignette, highlights & shadows. 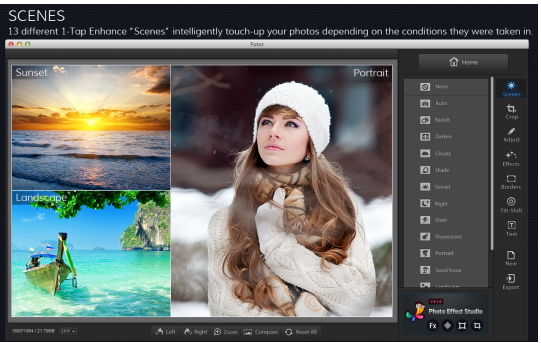 "Scenes" offers 13 enhance options preconfigured for various photo capture conditions. Effects & Borders stretches your creativity further with Fotor's huge palette of effects and borders. Batch Processing lets you make short work of large numbers of photos. Apply effects and frames with just one click, instead of having to do it to each photo.